For the third year in a row, Montréal Roller Derby of Montréal, Québec, Canada (Seed #2, WFTDA #7) took on Bay Area Derby of San Francisco, California, U.S. (Seed #7, WFTDA #19) in the International WFTDA Playoffs, and came out victorious once more. Defeating Bay Area 231 to 168, Montréal keeps their hopes of returning to the International WFTDA Championships in 2018 alive. The eighth matchup of the 2018 International WFTDA Playoffs Atlanta was a roller coaster of a game, with Montréal leading by just one point at the half; but the combination of their strong defensive formations, powerful strategic offense, and jammer awareness allowed Montréal to pull ahead of Bay Area significantly by the end of the game. Despite swapping lead jammer runs and nearly matching Montréal for penalties throughout the game, Bay Area was unable to make headway in the second half, scoring only 64 points to Montréal’s 128. Montréal and Bay Area’s distinct styles of play made for a compelling and unpredictable game. The strength of Montréal’s blockers lay in their tight, cycling, tripod walls, and relentless individual blocking. Bay Area, on the other hand, relied on the flexibility of their blockers to move between braced three-walls and their classic, but deadly, flat walls. Bay Area’s Dirtt and Gretchen Vomette ended with six penalties a piece, but their noteworthy heavy hitting challenged Montréal’s wily jammer lineup. Montréal, meanwhile, employed an extremely effective “explosive offense,” in which they broke apart Bay Area’s defense from the inside, keeping Bay Area’s blockers apart from one another while their own walls stayed together. This allowed Montréal’s jammers the space to slide through an often fast pack, building their lead to an ultimate victory. “We’re just planning on fine tuning from this, taking whatever we can learn and just keeping it slow and really working on what we practice all season,” skater Biggley Smallz told WFTDA.tv of Montréal’s preparation for their next game. “We’re not taking anything for granted. It’s going to be a strong match,” added Falcon Punch. 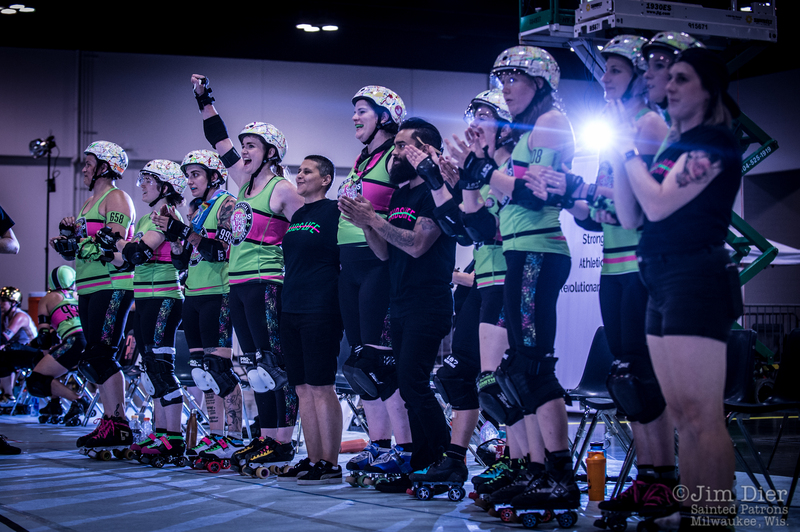 Montréal moves on to play Jacksonville Roller Derby (Seed #3, WFTDA #9) at 8:20 p.m. EDT tonight, while Bay Area will play the Atlanta Rollergirls of Atlanta, Georgia, U.S. (Seed #4, WFTDA #11) in the consolation bracket at 1 p.m. EDT on Sunday.